If you are counting macros, you are trying to get away from the idea that there are good and bad foods. However this doesn’t mean that nutrition is not a priority. 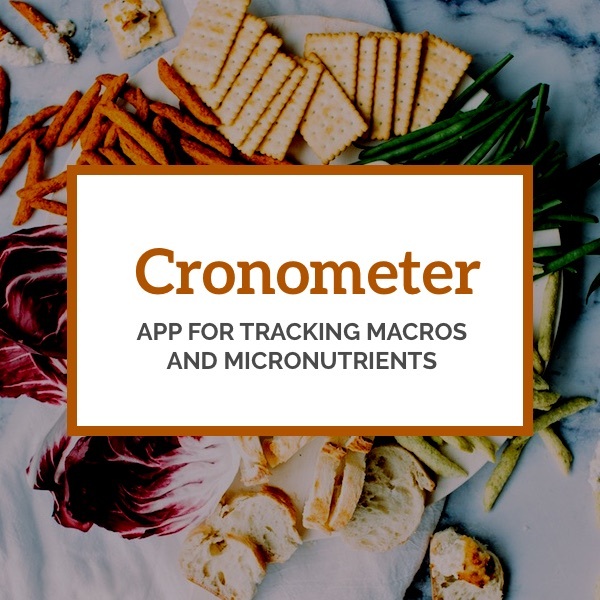 Cronometer is one of many diet tracking tools that can help achieve your macro targets, as well as focusing on micronutrition data. 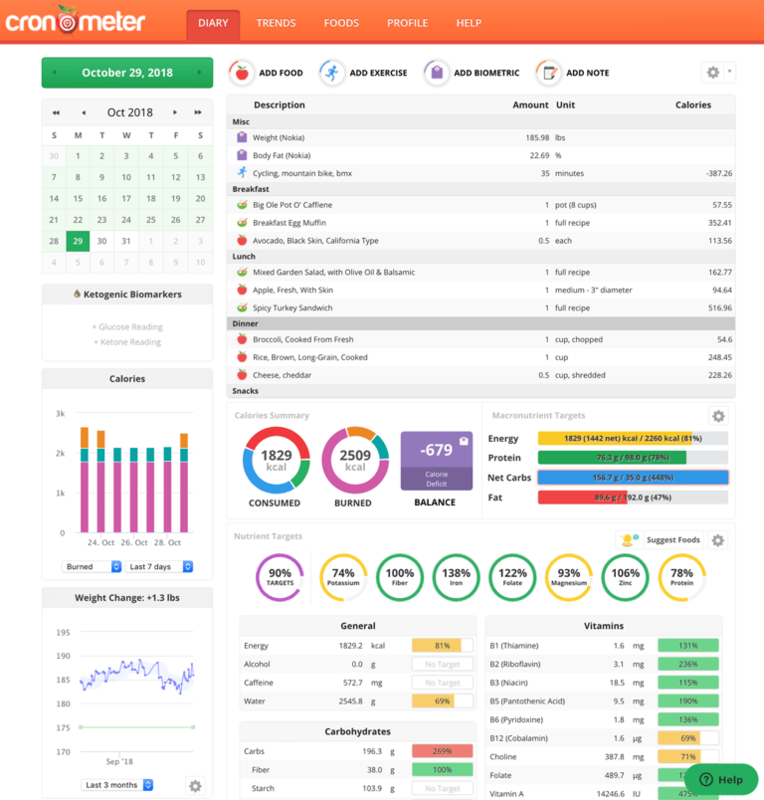 In addition to tracking macros in an easy to read graphic format, Cronometer also tracks micronutrients, including calcium (which we all know is essential for bone health) to B vitamins (which are sometimes hard to get in a vegetarian or vegan diet, or may be of concern if you’re recovering from certain medical conditions), to folate (which is well-known for its importance during pregnancy for a baby’s healthy brain development) and every other micronutrient. You can tweak your diet depending on your personal situation, or just reassure yourself that you’re getting what you need. Biometrics are an important way to see your diet’s impact on your health. Cronometer will track a wide range of biometrics, from weight and waist size to cholesterol levels, triglycerides, ketones, ferritin, and 25-Hydroxy Vitamin D. You can also track also include blood pressure, pulse, body temperature, sleep and even mood. Those with stroke risk can monitor and track blood pressure. Those with diabetes risk can measure blood glucose. Cronometer’s time stamp feature allows users to mark the time of day when they recorded their biometrics, food and exercise, so a user can see how biometrics change at different times of day, and if they are affected by timing of eating or exercise. Cronometer’s Trends feature is for measuring how habits are evolving over time, and how their weight and other biometrics are affected. Trends can tell us a lot about what we’re eating and how we’re feeling. 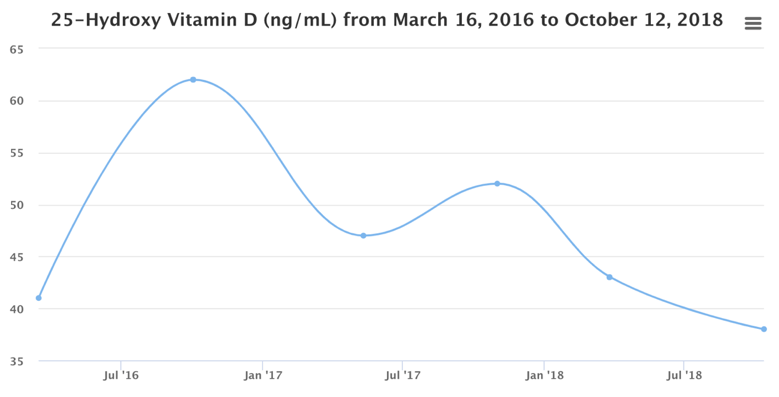 For those of us who used to put our daily weight on a calendar, having it show up right next to our daily calorie count in graphs is a revolution! Since trends can be measured over any length of time, from weeks to months to any custom range, this feature is excellent for those who prefer not to weigh themselves every day, but would still like to get an accurate report of their progress. odes, and every day users are adding foods they incorporate in their diets. A point of difference between MyFitnessPal is that (according to cronometer) a team of experts reviews and corrects every entry before it is added to the public database. Each item also has its sources listed: from laboratory analysis, nutrition labels, or custom foods and recipes. Cronometer will suit any dietary regime – from vegans to keto dieters. Since you set your own targets, you decide what macros are right for you, and you can always make changes. The degree of detail you want to get into with Cronometer is entirely up to you. Just glancing at the green, red and blue on the macro circle and total calories each day may be all you need to know. Or you may be training for a race, trying to have a baby, or fighting a serious health condition, and want to know all the information you possibly can. It’s also possible to set email alerts for when you haven’t made an entry that day. Signup to the web version is free, however Gold membership unlocks extra features and completely removes all ads. The smartphone app is priced at $2.99. There is also a professional version for dieticians and other health professionals who want to help a group of clients manage their programs, but for ordinary people, you can sign up right now and use it for free. See cronometer.com or download app for iPhone or Android. Cronometer just made some recent changes that I am not happy with. I used to be able to input nutritional information on a label in the customized foods section. Now, it seems that you have to list ingredients off the package in order to get any caloric and nutrition reading. I liked manually inputting all of this because it does not say on the packaging how much of the ingredient is used. It is extremely frustrating. I can only see this working for a homemade recipe in which the user knows the measurements of each item. Stop updating cronometer because it is going backwards. I will go elsewhere and recommend others to do the same.